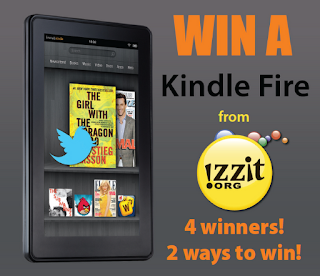 izzit.org News: Win a Kindle Fire! Any U.S. teacher who is an izzitPLUS member or a Facebook or Twitter follower as of December 1, 2012 and has ordered a DVD from izzit.org since July 1, 2012 will automatically be entered to win one of four Kindle Fires. Read the Official Contest Rules on our website. Click the icons below to sign up or follow us today and have a chance to win!